Sticking to a low-fat, low-carb diet five days a week is hard work, my friends, so the fruity treats I reward myself with on weekends really are what the title says they are! After a huge plate of baby back ribs and mashed potatoes, I thought I was going to be too full for dessert but I wasn't able to resist. The meringue-based cake with fruits and cream was smooth with a crunch--just the way I like it--but I wish they served it with an assortment of fresh fruit. 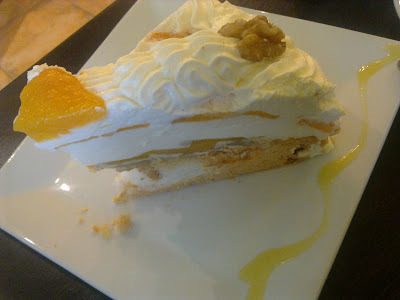 The Peach Walnut Torte is one of my favorite cakes at Conti's. The layers of peaches, cream, walnuts and meringue never fail to satisfy. It sort of tastes like a peachy version of sansrival. One tip, though: Don't order this to go if you want a nice big slice. Their takeout Styrofoam containers are so small that the torte becomes squished. All that fruity goodness was worth the wait!